The Pickaway County Community Foundation recently memorialized an esteemed former Westfall teacher, Emily Nelson, posthumously. 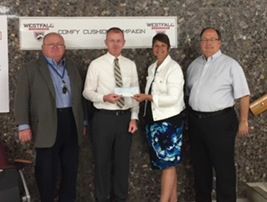 This gift commemorates Mrs. Nelson, a former director of the Pickaway County Community Foundation, with a $1000 grant to the Westfall School District. This grant enables the district to get closer to its goal of improving the high school auditorium where Mrs. Nelson spent many hours supporting her current and former students in their endeavors on the stage. Emily also served on the Westfall Education Foundation for over ten years.